Nowadays stress of work, city lifestyle, the pressure of survival and relationship conflicts are generating common psychosomatic issues like a weak digestive system, insomnia, headache, migraines, lower back pain, obesity, neck issues, vision problems, joints pain, wrong breathing patterns, incorrect spinal alignments etc. Rehabilitation Yoga Therapy group retreat brings a solution to this common issues faced by modern humans. The ancient knowledge of Yoga and Tantra is formulated in a very easy manner so that a common person can imbibe the wisdom, adopt it in daily routine and bring a considerable healthy change in their life even if they can only find a few minutes a day in their busy lives. Rehabilitation Yoga Therapy is not only about physical exercises, it also helps one understand the Ayurvedic concept of food and lifestyle and cooking healthy food according to the body type and seasons. While sitting in silent observation of the self, singing, dancing and celebrating the life, connecting with nature and observing natural forces to heal the self of emotional issues and opening the heart to understand other people is all a part of Rehabilitation Yoga Therapy. Applied Yoga Studio is a combination of art and 19 studios which runs a dynamic cultural programme. It is a place where students open to cultural exchange, where influencers in the community walk the halls with the cultural change makers of tomorrow. Ganga Aarti: the fire ceremony of purification exist since 1000 years ago. After exploring various tools and techniques of yoga and meditation for decades, Yogi Krishna realized that yoga alone or Tantra alone is somehow not enough. It almost felt like something is missing from his practice and that yoga and Tantra need to be merged and work together in harmony. From there around 2008, he started his journey of Tantra yoga. To him, yoga and Tantra have become just two names for the same thing. Born with a curious mind to know the mysteries of the universe, how the lessons and karma of one life pass through another life. Born with an ongoing adventure of traveling inside and experiencing the height and depth of herself made Yogini Masha interested in diving deeper into the essence of yoga and Tantra. With the freedom of Osho, discipline of Paramhansa Swami Satyananda ashram, Maharishi Ramana silent way of guiding to the truth, parenting approach of Veda Bharati, the compassion and love for woman wisdom of Karma yogini Kanak, the Egology of Maharshi Balyogi Premvarni, and the direct guidance of yogi Shri Govinda Niranjan, the imbibed essence of all in one is reflected in her teachings. The best of both worlds. This was the idea when Applied Yoga Studio was founded by two young twenty-something guys (not any longer by the way - they just turned 29, AGAIN). After travelling from one luxury hotel to another, when they were touring with international bands, they missed the atmosphere and cosiness they were used to when travelling to hostels for pleasure. "A yogi who can control his posture, food and sleep, can control death and old age." Guru Gorakhnath: Guru of the author Hatha Yoga Pradapika. Drawing upon EthnoAyurveda, Applied Yoga Research and Training Centre serve local, organic produce meals three times a day. %Considering that the food we consume has a direct impact on our emotional state, Applied Yoga Research and Training Centre make sure that the food is made with love and good intentions and a touch of Indian spice. Trip on a scooter to waterfall and Temples of Shakti Peeth. Please take note that the scooter rental is excluded in the price. Individual session of yoga therapy, alchemy meditation, Ayurvedic stretch, ayurvedic diagnosis, panchakarma, massage and other spa procedure are available at an additional cost. Please book your flight to arrive at Indira Gandhi International Airport (DEL). Transfer from and to this airport is available upon request with an additional charge. It will take six hours from the airport to reach the center by taxi. Journey by a bus or train from this airport to the centre will take around 10 hours. You can also book a domestic flight to Dehradun Airport (DED) for one hour. Transfer from the airport is also available at an extra cost. Airport: Jolly Grant Airport Airport transfer available: Jolly Grant Airport Additional charges may apply. You can request this in the next step. 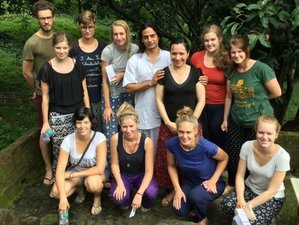 Applied Yoga Research and Training Centre offers Yoga therapy, Tantra yoga, Meditation retreats, online courses & specialized teacher training courses. Please consider booking this course three months in advance. There is an additional charge of 10 USD per day if you would like to stay in an air-conditioned room.